Career discovery platform Sokanu released results of its survey of the happiest workers and jobs in America. The 2017 survey about job satisfaction in America reached 150,000 people across 599 career paths to discover which industries offered workers the best and happiest future. And it turns out that where in the country you live and work is an equally important factor. Hawai’i claimed the top spot with the happiest workforce in America for the second year in a row, with Alaska (up six places from last year’s survey) and Wyoming (up three places from last year’s survey) rounding up the top three. New Mexico climbed 42 places to earn itself the fourth spot, with West Virginia falling three spaces to fifth place. It seems that the East Coast is where the country’s unhappiest workforce resides with 4 out of 5 of the least-satisfied states being from New England. Oregon made a debut in the bottom five falling 20 places to the 46th spot, with Rhode Island, Pennsylvania and Massachusetts following in 47th, 48th and 49th place respectively. Washington, D.C., was labelled the least-satisfied state, falling 12 places to the bottom spot. Creativity was a big factor in job satisfaction — Video Game Producer, Film Director, Music Producer and Comedian were labelled as the happiest jobs in the country, along with Neurosurgeon. Service-based location-dependent jobs such as Telemarketer, Store Clerk, Cashier, Janitor and Machine Feeder were rated as the nation’s unhappiest jobs, signalling that passion-based creative jobs offer more job satisfaction than service-based jobs. Every year on Memorial Day, tens of thousands of people gather for Lantern Floating Hawaii on O‘ahu’s south shore to honor loved ones and generate hope toward the future. The special gathering allows people a personal moment to remember, reflect and offer gratitude to those who have gone before us. It is also a collective experience where families, friends and even strangers reach out with love and understanding to support one-another. Lantern Floating Hawaii helps to open hearts in an experience that transcends the human boundaries that usually divide us. The first Lantern Floating Hawaii was held in 1999. With the wish of creating cultural harmony and understanding, Her Holiness Shinso Ito, Head Priest of Shinnyo-en, officiated the inaugural Lantern Floating Hawaii ceremony on Memorial Day in 1999. For the first three years, the event was held at Ke‘ehi Lagoon on the south shore of O‘ahu. In 2002, the ceremony was moved a few miles to Ala Moana Beach where it currently takes place. You can watch a live stream of the ceremony on lanternfloatinghawaii.com on Monday, May 30, 2016, starting at 6:30 p.m. Hawaii Time. Local news station KGMB will also stream the event. The HAWAIIAN CULTURAL CENTER OF HAMAKUA will be a multi-cultural, multi-generational community center situated in the heart of Honoka’a where residents and visitors alike can deepen their connection to Hawaiian culture. The center’s adopted emblem of the he’e, or octopus, represents the center’s community outreach efforts. One arm of the he’e will reach out as classes in hula, the arts, Hawaiian language, history, agriculture, philosophy, and more. Another would extend into the community with special events, guest speakers, community service projects, and cultural exchange programs. Beyond our community, it will be a place where visitors can learn about the history and culture of Hawai’i in an authentic setting. 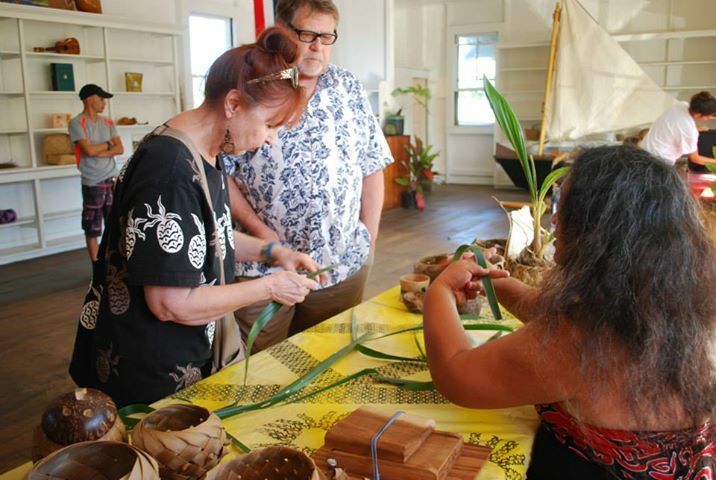 With a mini-museum curated in partnership with Honoka‘a’s Heritage Center, visitors will have a chance to browse historic memorabilia and talk story with volunteer docents knowledgeable about the area and Hawaiian history.